During a recent TFH level 1 workshop, a student began to experience distress signals from her bowels and hot sweats after consuming a delicious dessert. She rejoined our class after completing her 1hour porcelain communication with a distressed look on her face. At the same time, the class broke up into pairs to do a “balance as you go” on each other. This gave me time to assess the situation. The student felt that she could no longer continue the class (2nd day in the morning) and that she had to go home. After receiving permission to test her, I felt that we should at least perform a balancing on her to support her energy and hope for the best….I had a level 2 student provide the balancing with level 1 criteria’s (balance as you go). After all, it was a level 1 class and this was an opportunity to engage in a real life situation. 20 minutes later, with continued hydration and balancing the stomach, small intestines and large intestines meridians, the emotional stress release (ESR) technique proved worthy as a final support. The student felt great, able to continue the class and eat lunch without any ill affect! This experience reinforces confidence in trying a balancing with what you know, even while you are learning level 1. 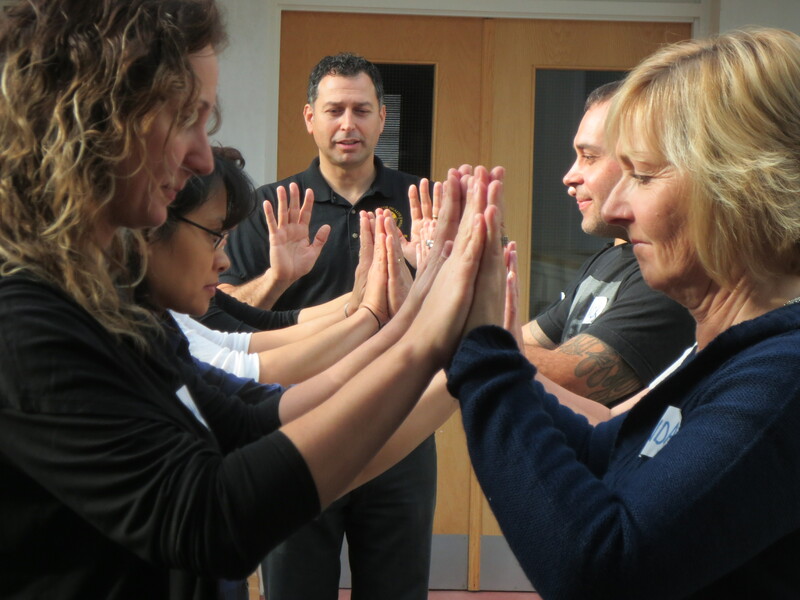 A dance instructor had the opportunity to experience a touch for health balancing from her sister that recently completed level 2. As this student flew to the west (from Toronto), she instructed this dancer to write some goals down before she arrived (very efficient). Well, to her surprise, she was confronted with 20 goals. I thought this would be great practice for her since each goal (inhibited/unlocked) would require a 14 muscle balance. The dance instructor’s symptoms included the usual aches and pains throughout the body that these athletes endure. She was also unable to sleep soundly. She has been teaching for more than 20 years. During the balancing, this student would use a variety of techniques from level 1 and 2, but mainly used the wheel balancing and 5 elements. She did notice that some goals, that were inhibited, locked after only performing the usual 14 muscle test (all muscles were locking). This gives rise to the potential of moving the energy flow of the meridians with only the muscle testing. The dance instructor commented on the fact that she was able to perform her tasks instructing students with great ease, pain free and felt stronger and more balanced in her daily activities. She had restful sleep, which was uncommon for many years, which provided an opportunity to regain her energy and heal. Emergency room: The following is a letter from a student that has completed TFH level 1(M.F). Touch for health is a great addition to my family. Since we have opened ourselves up to the touch for health way of treating our bodies, we’ve been able to live life more positively and feel great about the choice of healing ourselves through the body’s natural energies. Recently I took part in the level 1 course of touch for health and it was the absolute best thing I had ever experienced. During the two day course we got the opportunity to learn from an amazing instructor and practice our new found knowledge on each other. Wow!!! Hard to believe that I can actually make a difference in someone’s health simply by knowing the 14 meridians! Recently, my son was home sick with food poisoning. It was such a great feeling knowing that I had enough knowledge, through what I learned in level 1 of the touch for health course, to be confident enough in myself to test and balance him. As I began the test I found that his stomach and large intestine meridian’s were unlocking only on one side. With the application of pressure and massage on the neurolymphatic points associated with the stomach and large intestine I was able to provide him with relief from the cramping and pain. He was able to feel the benefit and more importantly, communicate to me what he was feeling and experiencing. It is amazing to know that I could use what I am learning on my 12 year old son and actually see how well it works. Looking forward to experiencing more and possibly helping others reap the benefit of Touch for Health. After spending five hours in emergency (arriving home at 7:30 am) with my son to rule out appendicitis I was wiped! My body was physically exhausted and my mind was following suit. It was through the support of Georgio and my fellow classmates that I was able to continue with the second half of the level 1 course. Thanks to everyone who helped balance me and gave me the opportunity to finish off the best course that I have ever been involved in. See you in the second part of our adventure! This student arrived at the course as we completed a student exchange. I began to muscle test this student during day 2 of TFH level 1 and found that she was unable to lock with any muscle. She was certainly overwhelmed from her son’s experience (and lack of sleep). I had another student perform the ESR technique. After a few minutes, she came back to life! She felt her energy rise and her muscles starting locking. This was a great opportunity to show how a 1 point balancing works and introduce TFH level 2. We were now able to communicate with her system and provide her with a TFH balance. This entry was posted in Workshop Student Feedback. Bookmark the permalink.